Compact, powerful and easy to drive. 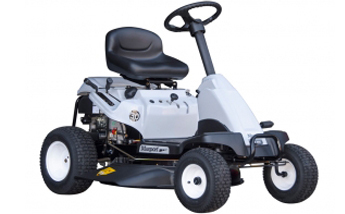 This rear engine rider with its simple controls, great operator visibility and 30" cutting deck will make short work cutting the grass around the home. The 10.5HP Briggs & Stratton engine provides ample power while the cast iron sleeve increases the durability and longevity of the engine. Equipped with 30" steel side discharging cutting deck for fast and efficient mowing. Compact design for smaller lawns - allows easy access and storage.